The Summer season is almost here! Today we head to Six Flags Magic Mountain for an update as the park prepares for its busy season that begins in just a few days! We check out the Crazanity construction site, review the new DC Super Heros VR on Lex Luthor, and more! Cold Stone Creamery is officially gone, and the new Plaza Ice Cream and Shakes has taken over its prime location in the main plaza. The New Revolution was down today for maintenance, and will hopefully open back up soon for the Memorial Day weekend crowds. 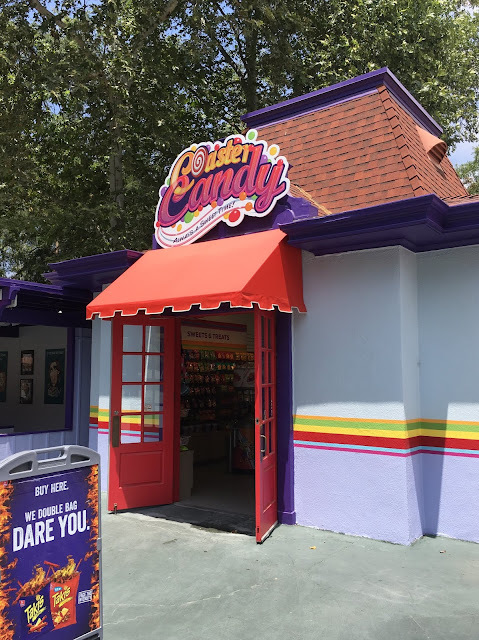 This Coaster Candy location near Full Throttle received a fresh coat of paint with some vibrant signage, and looks great! Six Flags is now letting guests scan their Season Photo Pass card to retrieve their on-ride photos at select rides. This machine is now up and running at Goliath. The limited-engagement DC Super Heros Drop of Doom VR is currently running on Lex Luthor: Drop of Doom. The park is utilizing the same Samsung Gear VR Oculus headsets that they have used before, but this installation on a drop tower is unique. This table is set up right before you board the attraction, and all riders are given the option to ride with or without the gear. The ride is themed to the Justice League team fighting against Lex Luthor. Your avatar is shown in the beginning with others in these floating egg-shaped pods. As the ride starts to climb, Lex Luthor breaks in and gains control of everyone's pod. After rising high above the virtual metropolis, your pod eventually drops along with the physical ride. But not to worry, as you are caught at the bottom by a virtual Wonder Woman before "hitting the ground". The experience does add an interesting element to the ride. 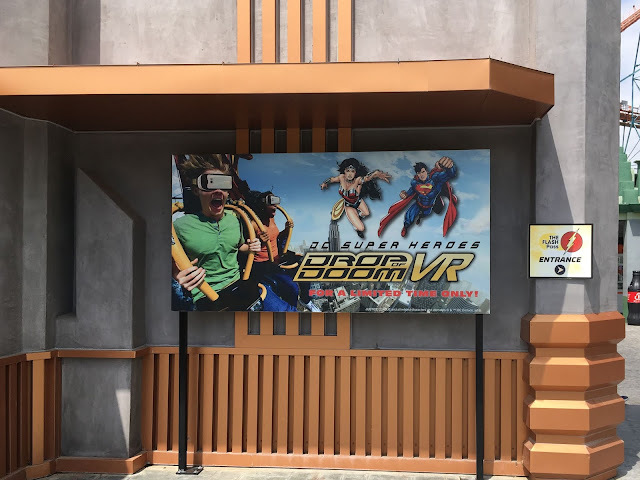 A main issue is that the headsets do not have audio, and this experience contains dialogue unlike other Six Flags VR attractions. It can be strange and difficult to read the text bubbles that appear as each character speaks in the attraction. But, proper comprehension is not required to enjoy the ride. Overall, I thought the experience was pretty fun and worth the extra wait time for the ride that comes with cleaning and equipping riders with the gear. Moving on, this new GLO store right next door to Lex Luthor is now selling glow-in-the-dark merchandise to guests as the park reaches its extended-hours Summer season. Also in the vicinity, work on Crazanity and the revamped Boardwalk area is still chugging along. Summer is approaching fast, and it almost feels like the park is behind with their work in some areas of the project. But, these tasks seem like they can be completed pretty quickly once other aspects of the renovation wrap up. Johnny Rockets is still open and serving guests throughout the construction progress. Over on the main pad, Crazanity is still not vertical at this point in time. This area does look different compared to our last update in February, but there is still a ways to go. The queue line and main pad for Crazanity need to be finished, and then ride parts should start going vertical. The construction walls are still up all along the detour to the rest of the park. The bumper cars are in the midst of their facelift. The collisions will resume soon! 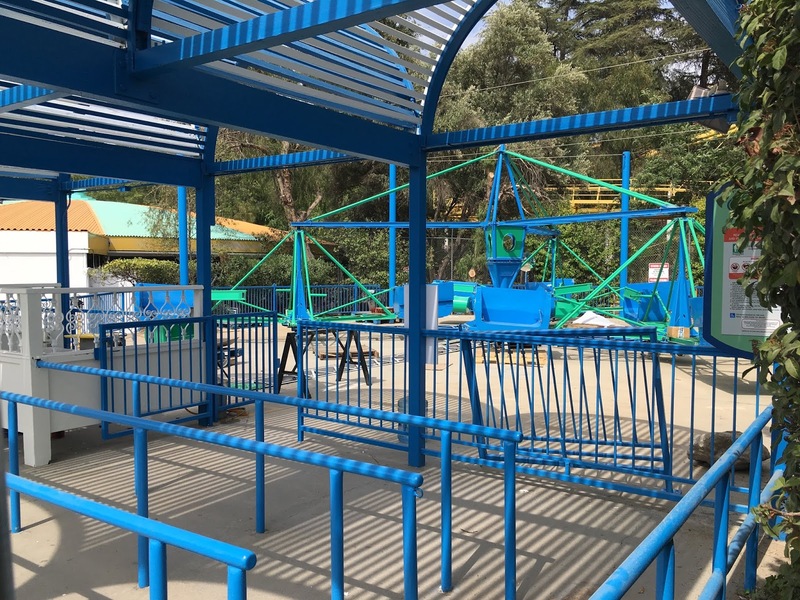 The Scrambler is also receiving some TLC, and it looks great! The Boardwalk area, with the new Crazanity and renovated flat rides, will be ready for park guests to experience soon! That's all for now from Theme Park Overload! Make sure to "Like" our Facebook page to get the latest updates from all of your favorite parks delivered straight to your newsfeed! Facebook.com/ThemeParkOverload My name's Nicholous, and Thanks for Reading!